Google offers a pretty comprehensive set of online applications which many of you probably take advantage of. Here is how to easily configure Firefox to use Google’s online offerings for email, RSS, PDF and office documents as your default in-browser viewer without the need for a pesky toolbar. 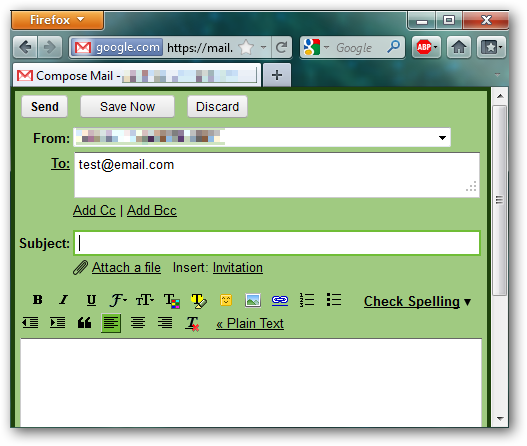 Firefox has the native ability to use Gmail for email. 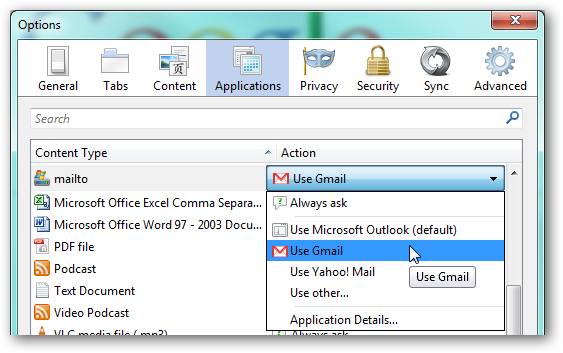 Open the Options dialog and go to the Applications tab and for the content type “mailto”, select “Use Gmail”. Now whenever you click on a mailto email link, assuming you are logged into Gmail, a new message will be created in Gmail. 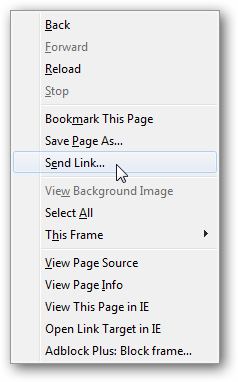 Additionally, the “Send Link” context menu command will create a new Gmail message with the current page title set as the email subject and a link to the page in the message body. 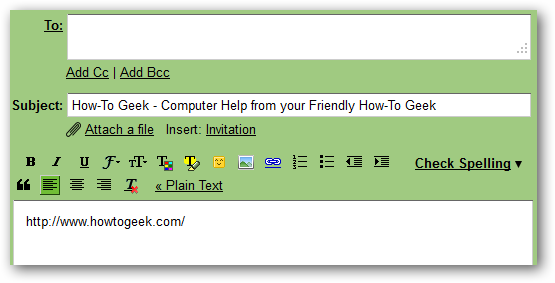 Like Gmail, Firefox has the native ability to use Google Reader as the default RSS reader. In the Applications tab for the content type “Web Feed”, select “Use Google”. 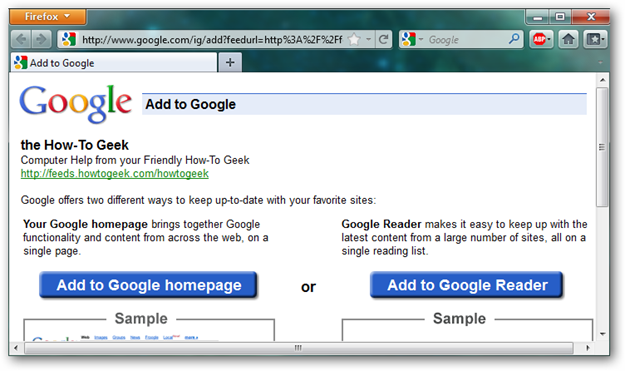 Once set, whenever you click on an RSS feed link, you will be presented with the option to choose whether you want to add the fees subscription to your Google homepage or Google Reader. Unfortunately, Firefox does not natively allow you to configure Google Apps as your default viewer for PDF, DOC, XLXS, etc. files. Before covering how to configure this, you may be asking why you would want to use Google Apps when you have a PDF reader and/or MS Office/OpenOffice installed on your machine. The short answer: security. As you may know, office files (PDF’s especially) are a popular vehicle for distributing malware. By opening these types of files you encounter on the web inside of Google Apps instead of on your local machine, you virtually eliminate the security risk. So with the ‘why’ answered, we now move on to the ‘how’ which is essentially handled by the add-on, gViewer. 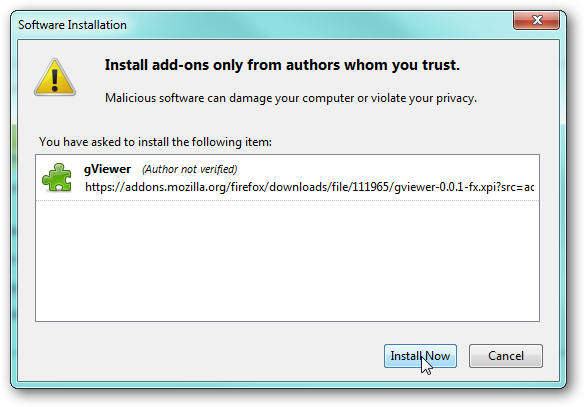 Simply install this add-on and then restart Firefox. Edit the options for gViewer. Configure gViewer to use the respective file formats you want to open using Google Apps. Now whenever you open one of the respective file types in your browser, you will see an information bar appear for a few seconds at the top. If you click the “Choose another application” button, you can open the document in your system’s default viewer, otherwise the document will be opened in Google Apps. 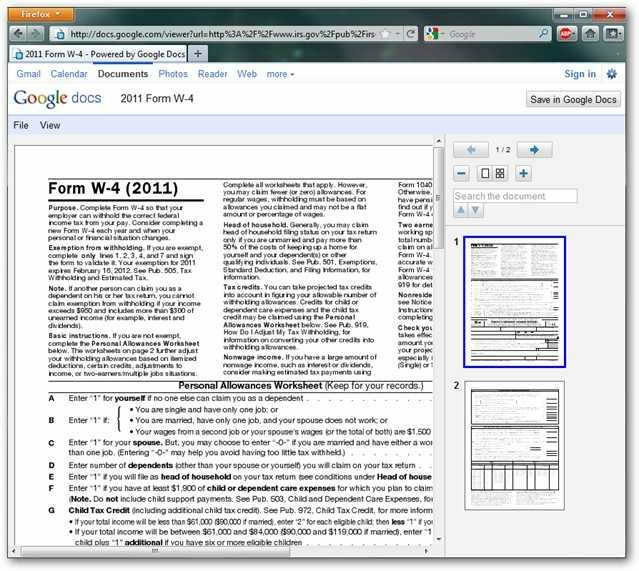 For example, clicking a PDF link on the IRS website opens the document in Google Apps. From here, if I am signed in to my Google account, I can easily add this document to my library of Google Docs. It is important to remember that while Google Apps will open the vast majority of documents with no issue, it is not a complete replacement for local system viewers. 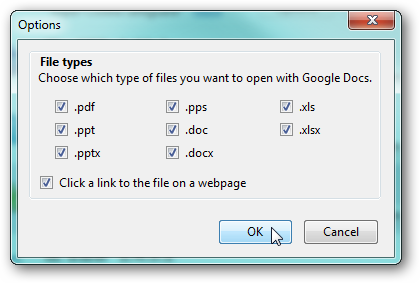 If you are trying to open a PDF or Word document which utilizes complex functionality, these may not open successfully in their Google Apps equivalent.